When John West, MD, PhD, was born in Adelaide, Australia, in 1928, his parents knew great things were to come. But they probably never anticipated their son would one day join Sir Edmund Hillary on one of the most famous Himalayan expeditions in modern history. In 1960, Dr. West joined Hillary and a small group of physiologists on what later became known as the “Silver Hut” expedition. The team spent several months at 19,000 feet, just south of Mount Everest, where they studied acclimatization and the effect of oxygen deprivation on human health. This experience was the beginning of what has become a lifelong study of high-altitude medicine and physiology for Dr. West. In, 1981 he returned to Everest, this time heading up the American Medical Research Expedition where the world’s first physiological measurements were taken on the summit. Today at age 84, Dr. West serves as professor of medicine and physiology at the School of Medicine, University of California-San Diego, where he has been since 1969. His research there now focuses on a new technique known as oxygen conditioning. The limited oxygen at high altitudes can have adverse effects on health—impacting mental function to pulmonary capacity to sleep. But now with this new technique, oxygen can be added to air conditioning systems. After completing his medical degree at the University of Adelaide, Dr. West spent 15 years at the Royal Postgraduate Medical School in London. It was there that he became interested in effects of gravity on the lung and participated in a groundbreaking study that discovered a way to demonstrate regional differences of blood flow to the lungs. Then, in 1967, he took a sabbatical to the NASA Ames Research Center. “At that time, the U.S. space program was just getting under way. While I was there, I applied to NASA to conduct research measuring pulmonary function in space. It was funded, so I moved to California to do this work,” he explains. Since moving to UCSD to pursue the project in 1969, Dr. West has not stopped researching, writing, and teaching. For the past 35 years, he has been in charge of the physiology course for first year medical students and his book, Respiratory Physiology: The Essentials, is used by medical students worldwide. 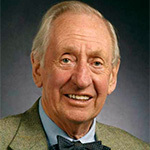 “John West is one of the giants in respiratory physiology with the ability to take a complicated topic and make it appear simple, while still retaining the rigor of the discipline. His lectures on respiratory physiology are simultaneously accessible and accurate,” says Kim Prisk, PhD, DSc, professor in the Departments of Medicine and Radiology at UCSD, who has worked with Dr. West for 32 years, including five space shuttle missions and work on the International Space Station. Dr. West joined ATS in1969, and in 2002, he was awarded the Edward Livingston Trudeau Medal by the ATS, recognizing his lifetime of contributions and leadership in pulmonary medicine. Dr. West has a son who is a professor at Stanford University, a daughter who works with a nonprofit in New York, as well as three grandchildren. He enjoys Baroque music, and he sits on the board of the Bach Collegium San Diego.